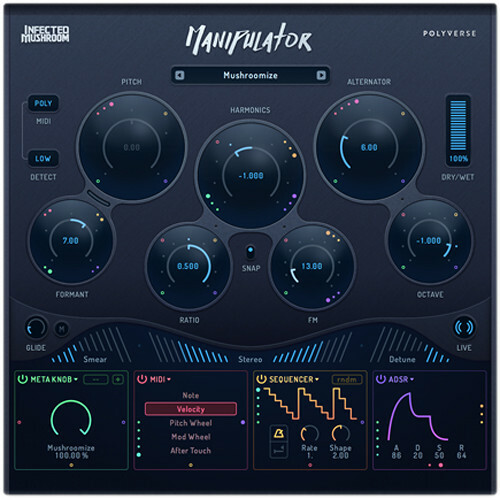 Manipulator from Polyverse is a vocal processor plug-in that uses innovative, granular algorithms to produce timbre-bending and pitch-shifting effects for voices and instruments in real time. Designed to be practical and spark creativity, it provides DJs, musicians, and producers with a set of creative tools for pitch correction and harmonization, as well as powerful modulation effects for unleashing full-on sonic mangle. Manipulator takes a vocal track or live performance and transforms it into a complex, entrancing new sound. It also works well with other monophonic and rhythmic sources. The plug-in can pitch-shift the source audio to specific notes received from a MIDI track or an external keyboard, ideal for changing melodies, even during live performances. Manipulator supports up to four polyphonic voices when used with a MIDI input.